Malone didn't have a catch Sunday on his lone target. Analysis: Malone had one catch and 12 yards on five targets all season, dressing for just nine of the 16 games this season. It's very much in doubt that he'll be in the Bengals' plans next season. Malone (coach's decision) is inactive for Sunday's game against the Raiders, the Cincinnati Enquirer reports. Analysis: Malone is a healthy scratch Sunday, which sets the stage for Tyler Boyd, John Ross and Cody Core to head the Bengals' Week 15 wideout corps. Malone wasn't listed on Wednesday's injury report, Paul Dehner Jr. of The Cincinnati Enquirer reports. Analysis: Malone hasn't played in a game since Week 8 against the Buccaneers, where he played 11 total snaps. The Tennessee product was listed as questionable going into Week 14, but was ultimately ruled out. Though Malone is listed as a depth receiver, being healthy is a first step to gaining a bigger role in the offense. Malone (hamstring) is officially inactive for Sunday's game against the Chargers, Geoff Hobson of the Bengals' official site reports. Analysis: Malone was listed as questionable after practicing on a limited basis but will miss his fifth straight game. The 22-year-old has been unable to take advantage of A.J. Green's (foot) absence, leaving Alex Erickson and Auden Tate to serve as depth options at wide receiver for the Bengals. Malone (hamstring) is officially listed as questionable for Sunday's game against the Chargers, Geoff Hobson of the Bengals' official site reports. Analysis: Malone has missed four straight games due to a lingering hamstring injury, but he appears to have a real shot of retaking the field Week 14. The second-year wideout could be a game-time decision for Sunday's tilt against the Chargers. If Malone is able to suit up, he could see an uptick in offensive snaps in the absence of A.J. Green (foot). Malone (hamstring) was a limited participant in Thursday's practice, Jay Morrison of The Athletic reports. Analysis: Malone was also limited during Wednesday's practice session. The second-year wideout has missed four straight games, and his status for Sunday's tilt against the Chargers is murky at best. With A.J. Green (foot) on injured reserve, Malone could see limited offensive work when he retakes the field. Malone (hamstring) was ruled out for Sunday's game against the Broncos, Katherine Terrell of ESPN.com reports. Analysis: Malone was unable to practice this week and will miss his fourth straight game with the hamstring injury. Alex Erickson and Cody Core should work as depth receivers for the Bengals with A.J. Green (toe) making his return. Malone (hamstring) didn't participate in practice Wednesday, Jay Morrison of The Athletic reports. Analysis: Malone has missed three straight games with this injury. The Tennessee product's practice statuses later this week will help paint a better picture of whether he will play or miss his fourth straight game. If Malone does miss more time, Alex Erickson and Cody Core would likely retain their depth roles. Malone (hamstring) will not suit up for the Bengals on Sunday against the Browns, Jay Morrison of The Athletic reports. Analysis: Sunday will be the third consecutive game missed for the Tennessee product. This news comes as no surprise, as Malone has been unable to practice for the last two weeks. Alex Erickson and Cody Core will likely act as the primary depth wide receivers yet again for the Bengals on Sunday. Malone (hamstring) didn't participate in practice Wednesday, Paul Dehner Jr. of The Cincinnati Enquirer reports. Analysis: This hamstring injury has forced Malone to miss the last two games. In addition, Malone hasn't been able to practice in the last two weeks. Starting off the week with a missed practice isn't a great sign for Sunday, but Malone's participations -- or lack thereof -- later this week will paint a better picture. Malone (hamstring) has been ruled out for Sunday's game against the Ravens, Katherine Terrell of ESPN.com reports. Analysis: With A.J. Green (toe) also likely out this week, Alex Erickson and Cody Core are likely to act as the Bengals' primary depth wideouts behind Tyler Boyd and John Ross (groin). Ross is listed as questionable with the injury, so there's a chance both Erickson and Core could have regular roles in three-receiver sets in Week 11. Malone (hamstring) isn't participating in Thursday's practice, Jay Morrison of The Athletic reports. Analysis: With Malone opening the week with back-to-back absences at practice, the wideout appears to be trending toward missing a second straight game Sunday in Baltimore. If both Malone and A.J. Green (toe) are sidelined again, Alex Erickson, Cody Core and Auden Tate would likely work as the primary depth receivers behind Tyler Boyd and John Ross (groin). Malone (hamstring) didn't practice Wednesday, Geoff Hobson of the Bengals' official site reports. Analysis: Malone sat out Sunday's 51-14 loss to the Saints with the injury and continues to work toward a full recovery. His absence from the first practice of Week 11 isn't an encouraging sign, but Malone will have two more chances to prove his health in practice before his status is solidified. If Malone is able to play in the Bengals' matchup with the Ravens this weekend, he could have a role on offense with A.J. Green (toe) looking unlikely to be available. Malone (hamstring) has been ruled out for Sunday's game against the Saints, Paul Dehner Jr. of The Cincinnati Enquirer reports. Analysis: With A.J. Green (toe) also out, Tyler Boyd, John Ross and Alex Erickson figure to lead the Bengals' Week 10 wideout corps, with Cody Core and Auden Tate also in the mix. 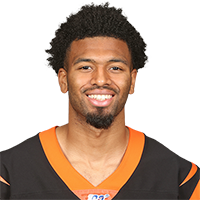 Malone was added to the Bengals' injury report Thursday as a limited participant in practice due to a hamstring issue, Jay Morrison of The Athletic reports. 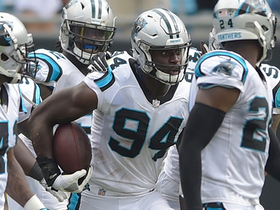 Malone caught one of three targets for 12 yards during Sunday's 31-21 loss to the Panthers. Analysis: Malone was on the field for 29 of the Bengals' 65 offensive snaps (45 percent), though his three targets were third-lowest on the team. His lone catch was his first reception of the year, and he doesn't figure to play a significant role in Cincinnati's offense as long as A.J. Green (groin) and Tyler Boyd continue to take up the lion's share of the targets. 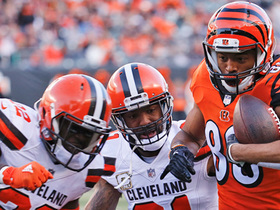 Malone had three catches for 41 yards Thursday against the Bears in the Bengals' preseason opener. Analysis: Malone showed well in his attempt to lock down a rotation spot in the Bengals' wide receiver corps. Rookie Auden Tate also had a good showing, so the battle for the fourth spot is hardly finished. Malone (hamstring) returned to practice Monday, Paul Dehner Jr. of The Cincinnati Enquirer reports. Analysis: Malone had shown well in OTAs and training camp prior to tweaking his hamstring, and the wideout's chances of securing a roster spot have further increased following the release of veteran WR Brandon LaFell. The 2017 fifth-rounder seems to have recovered from the minor hamstring injury, and he could be active for the Bengals' preseason opener against the Bears. Malone tweaked a hamstring Sunday, but before that was having a good start to training camp, the Dayton Daily News reports. Analysis: The Bengals' release of Brandon LaFell opens up one more roster spot among their young wide receivers. Malone, a fourth-round pick last season, was likely going to make it anyhow, but this may give him a chance at more playing time, at least when the Bengals use four-wide sets. He's competing against Alex Erickson, Cody Core and rookie Auden Tate. 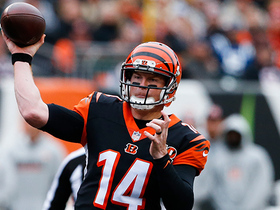 Malone (ankle) did not return to the Bengals' Week 17 finale against the Ravens. He was not targeted in the passing game. 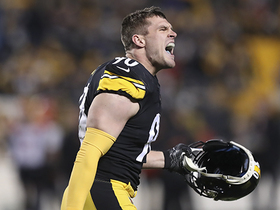 Analysis: Malone last caught a pass in Week 13, on the play where the Steelers' Ryan Shazier got hurt. The fourth-round rookie finished with six catches for 63 yards and a touchdown. While there's time for development from Malone, he'll be behind A.J. Green, Tyler Boyd and John Ross for sure, and Brandon LaFell if the Bengals bring him back too. Malone is questionable to return to Sunday's game against the Ravens with a right ankle injury. Analysis: Malone sustained the injury towards the end of the first quarter. Alex Erickson and Tyler Boyd could both see increased snaps as the Bengals' No. 3 receiver while Malone is held out. Malone caught both his targets for nine yards in Monday's 23-20 loss to the Steelers. Analysis: Malone has only six receptions for 63 yards and a touchdown on the season, but he played 33 of 64 offensive snaps in Monday's game, compared to fellow receiver Tyler Boyd's 15 snaps. Rookie John Ross (shoulder) was placed on injured reserve, but that is unlikely to have a major effect on Malone's season, as Ross has mostly been a non-factor in his first professional season. Carolina Panthers defensive end Efe Obada dives and scoops to intercept Cincinnati Bengals quarterback Andy Dalton, a pass intended for Cincinnati Bengals wide receiver Josh Malone. 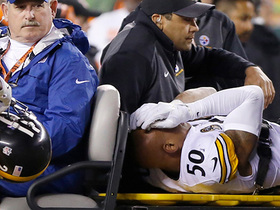 Pittsburgh Steelers linebacker Ryan Shazier carted off field after suffering injury. Cleveland Browns safety Jabrill Peppers delivers monster hit on Cincinnati Bengals wide receiver Josh Malone. Cincinnati Bengals QB Andy Dalton gets hit as he throws to wide receiver Josh Malone, who gets his first career touchdown catch. Pittsburgh Steelers cornerback William Gay picks off a deflected pass from Cincinnati Bengals quarterback Andy Dalton.